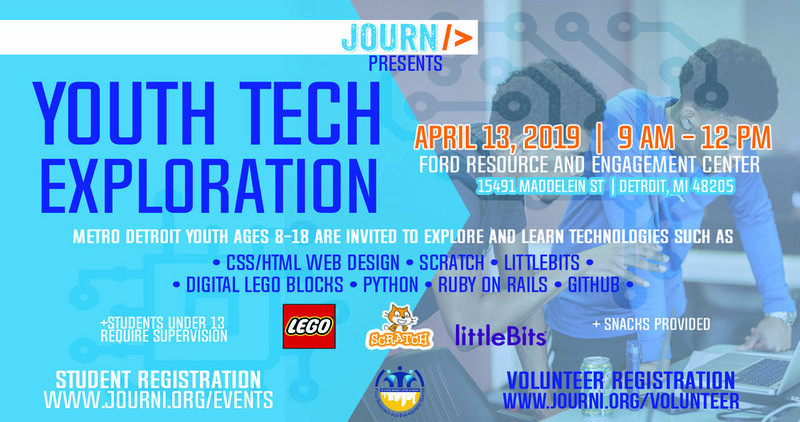 ALL YOUTH 8-17 IN METRO DETROIT ARE INVITED TO COME TO JOURNI’S YOUTH TECHNOLOGY EXPLORATION! WE WILL INTRODUCE YOU TO WEB DESIGN, BUILDING BLOCKS WITH WEDO, LITTLE BITS, AND SCRATCH. FOR MORE ADVANCED ATTENDEES, WE’LL HAVE OTHER AWESOME THINGS TO DO (MAYBE PYTHON, RUBY ON RAILS, OR GITHUB). YOU’LL HAVE AN OPPORTUNITY TO EXPLORE TECHNOLOGY IN A FUN COLLABORATIVE ENVIRONMENT. SO REGISTER TODAY, SPOTS ARE LIMITED!